BBC NEWS | Business | Davos 2009 | How bad is the crisis going to get? How bad is the crisis going to get? 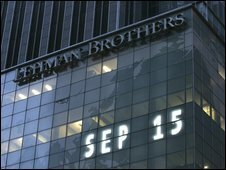 Lehman's collapse roiled financial markets. 36 hours in September changed the world. When investment bank Lehman Brothers collapsed, the credit crunch became a global financial crisis. But how bad is that crisis? Was it wrong to let Lehman fail? Or was Lehman just a symptom not the cause of the chaos in the global economy? Tough questions, and the World Economic Forum had lined up five top experts (including two Nobel prize winners) to find answers. The economists among them were Crunch Cassandras; two or three years ago they had predicted that our financial system was headed for a huge liquidity crisis - Nouriel Roubini, Nassim Taleb and economic historian Niall Ferguson. A pity then, a participant said, that two years ago nobody had thought of inviting them to speak at the forum. Little wonder that this session was hugely oversubscribed, with 150 people on the waiting list and probably more than that crowding into one of the cavernous dining rooms that are the hallmark of Davos hotels. Under Davos rules this was a closed session, to encourage frank debate. So with a few exceptions I am not allowed to attribute quotes to individual speakers. But I can report what was said, and this session was an intellectually stimulating eye opener - and utterly depressing (at least economically). The biggest question, of course, is how bad is it going to get, and nobody - neither on the panel nor in the audience - dared to provide any cheer. There was talk of "Depression Lite" and "Depression 2.0", although the experts also pointed out that it was unlikely to get as bad as the 1930s. Back then, the US economy shrank on average 14% a year, prices fell at 8% a year and unemployment peaked at 25%. The sharp rate cuts and fiscal stimulus packages around the world would prevent a repeat, everybody agreed. Still, warned one of the experts, the world would have to brace itself for "a best case scenario" of at least a year of recession and a "lost decade" of low growth - and most people were still in denial about this prospect. But what caused the crisis? A popular theory is that Washington is to blame for the "global cardiac arrest", because it allowed Lehman to fail. The panellists rejected this suggestion as "tosh" and "a myth". 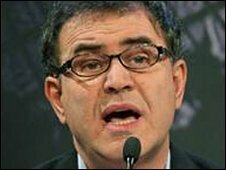 Nouriel Roubini warned of a credit crunch two years ago. This crisis, several economists said, started two years earlier and was "bound" to lead to a financial meltdown - whether it was a bank like Washington Mutual or the likes of Lehman and other parts of the lightly regulated shadow banking system of investment banks, hedge funds and broker dealers. "How could banks be so stupid?," several panellists asked, and allow things go so wrong so quickly? The root causes for the economic crisis were too much debt, a culture of short-term rewards for long-term risk-taking and fatally flawed mathematical risk models. And plain old greed. "Derivatives trading is all about how to make a bonus and how to screw your client," said Nassim Taleb, a former derivatives trader and author of "The Black Swan," a book about expecting the unexpected. The result was a mountain range of "troubled assets" (one of the great euphemisms of the crisis, one expert said) that resulted in billion dollar losses and the need to bail out financial institutions like Fannie Mae, Freddie Mac and AIG even before Lehman collapsed. Morgan Stanley, one expert ventured, was saved only because its share price bounced back when rumours emerged of Washington's $700bn bail-out package. Two thirds of the world's hedge funds would collapse, suggested another. Financial institutions took on debt worth 40 times their assets - and failed to understand how risky this was. Bank's risk models, a prominent participant revealed, were based on one year's worth of data. It was, another expert said, as if a pilot was assuming that he would never fly into a hurricane, because he hadn't come across one during the past year. Bankers had no memory, another panellist said, they had forgotten about the Asian crisis in the late 1990s, the collapse of the LTCM hedge fund, and much more. But it is too easy to single out the bankers - a banker said. Where were the regulators, rating agencies, corporate boards and central bankers? What about the borrowers, who did not read contracts and had to know they could not afford these mortgages? And what about the shareholders and investors, who did not question the business models of the companies they owned?